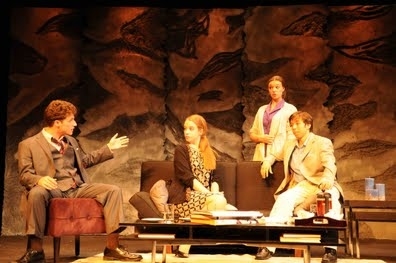 God Of Carnage, the first production of the 2011-2012 season for Niles North's Theater Department, completed a successful run over Labor Day weekend. The Tony Award winning play tells the dark, comedic story of chaotic evening where two sets of parents sit down for a meeting after their children get into a fight. The cast for the Niles North production was comprised of members of the Theater Department's Director's Circle — an audition-only program designed to give outstanding theater students an opportunity to hone their craft. Directed by Timothy Ortmann, the cast included William Boersma, Dylan Connelley, Catherine Hensley and Shannon Rourke. Alex Hammond served as technical director and Alon Stotter was lighting director. The Department's next play is Noises Off, from Oct. 20-22. 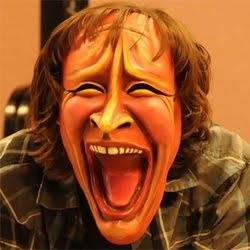 For more information, see nntheatre.com. Ever wonder who the talented folks are teaching students to make the great art displayed at Niles Township high schools? You can check out their artwork and meet the artists tonight from 5-8 p.m. at the Skokie Public Library. "Teachers As Artists" is the inaugural art exhibition featuring the work of staff members from across District 219. The show includes works from Lori Real, Michael Rush, Deanna Sortino, Barb Wismer, John Zilewicz, Amy Zwikel, Chris Sykora, Donna Seitzer, Jen Minelli, Katherine MacLennan, Amy MacCrimmon, Bev Feldmann, Meggie Boyle, Amanda Brooks, Dana Wade Kuzwayo, William MacBeth, Michelle Beatrice, Eve Rafas, Benjamin L. Keele, Debby Barabasz, Holly Lukasiewicz and Dan Doyle. "Teachers as Artists" will be on display in the library's gallery through Oct. 18. The library is located at 5215 Oakton St., Skokie, IL, 60077. Theatre Program Goes International, too! Members of the Niles North Theater Department received international exposure, too. Seven members of the department attended the Endinburgh Fringe Festival from Aug. 8-13, in Edinburgh, Scotland. They performed “Hide And Seek,” an original play developed by Timothy Ortmann, Niles North’s theatre director, and Niles North students, based on masked characters. In addition to the performance, group members had an opportunity to attend dozens of the 40,000-plus performances available during the festival. Making the trip are Alon Stotter, Jonathan Berg-Einhorn, Daniel Friedman, Martin Hannah, Sophie Scanlon, William Boersma and Dylan Connelley. 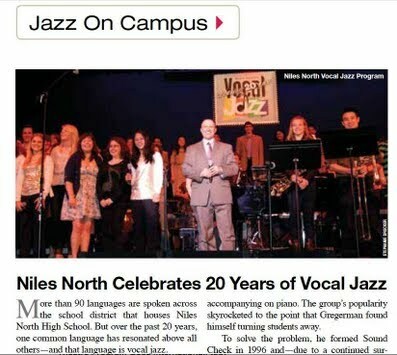 The September issue of DownBeat magazine, the granddaddy of American jazz magazines, features an article on the Niles North Vocal Jazz program’s 20th anniversary concert. Founded in 1934, DownBeat is considered the “Bible” of jazz worldwide/ Each month, the magazine selects one high school or college to highlight in its Jazz On Campus column. The magazine has a circulation of 70,000 rabid jazz fans monthly and is distributed to more than 100 countries around the world. The article is a true Niles North product as it was written by Stephanie Drucker, a junior at Niles North. Alkyer is co-Secretary of Niles North Fine Arts Parents with his wife Lori Helfand. See the complete article by clicking on the attachment at the bottom of the page.